The Pioneer Church, Los Angeles Cultural-Historical Monument #14, was built in 1903 with volunteer labor. The congregation served the entire northwest San Fernando Valley until the 1950s when other churches were built. Originally located at 10051 Topanga Canyon Boulevard, it was scheduled to be demolished in 1963 when the Chatsworth Historical Society was formed to save the building. In January 1965, the building was moved to the northwest corner of Oakwood Memorial Park, 22601 Lassen Street, Chatsworth, the first City Monument to be moved. Roy Rogers and Dale Evans Rogers were patrons of the CHS and assisted financially in the moving of the church. It was refurbished and rededicated in 1976 as part of the community's Bicentennial Celebration. On February 27, 1984, District VIII, California State Society, National Society of Daughters of the American Revolution, held a ceremony dedicating an historic marker for the building. It can be viewed when the building is open for tours. Olive Trees on Lassen between Topanga Canyon Blvd. and Farralone Ave., were designated in 1967 as L.A. Historic-Cultural Monument #49 at the request of the Chatsworth Historical Society. The trees were planted by the Lassen Street property owner Nelson A. Gray in 1893. 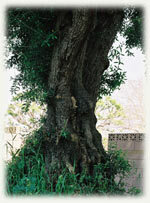 Native to the Eastern Mediterranean region, olive trees were introduced to California by Franciscan Missionaries. In 1967 there were 76 Olive Trees, today there are 68 remaining. The Harvester Barn is L.A. Historic Cultural Monument number 645, and is located at 22049 Devonshire Street. Built in the 1940's, this rural farm is now surrounded by suburban housing, where the main farmhouse is a California Ranch style structure with a basilica-type barn that can be seen down the long flag driveway. This site was the headquarters of the Palomino Horse Association of America and was Dan Huffman's barn. "Harvester" was a well-known Palomino stallion that stood at the ranch. He was the sire of "Mr. Ed." Before Dan Huffman lived there, Edna Fagan lived at the ranch when Harvester stood there. 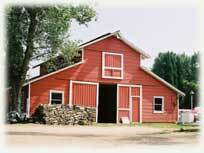 Dan had the barn named an historic monument. The Harvester Barn (not the entire farm) is designated as the historic monument. The Homestead Acre is all that is left of what was once a 230-acre ranch. It was settled in the spring of 1886 by James David and Rhoda Jane Hill. Minnie Hill, the seventh of their eight children, was born on the property in the fall of 1886. She later married Alfred Palmer and they lived on the ranch raising their two children. Many of the beautiful trees, flowers and shrubs still growing today, were planted by Minnie Hill Palmer and her family. The property is named to the National Register of Historic Places, and is Los Angeles Cultural Historical Monument No. 133. It is owned by the Los Angeles City Department of Recreation and Parks, with the Chatsworth Historical Society as Conservators. 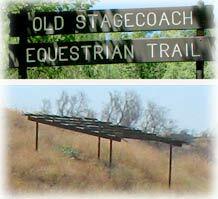 The Stage Coach Trail (Historic Cultural Monument Number 92) is a scenic hike along the historic Santa Susana Stage Road. Originally a trail was established by the Fernandeno/Tataviam and Chumash tribes, where later it became the El Camino del Santa Susana y Simi trail over the Santa Susana Pass and was the route that linked Los Angeles, Simi Valley and Ventura from 1861 to 1877. Sedimentary rock, scrub oak and fragrant sagebrush open to spectacular views of the City of Chatsworth and the San Fernando Valley. Near the top is a marker placed in 1939 by the Native Daughters of the Golden West commemorating the Old Santa Susana Stage Road. The Chatsworth Reservoir Kiln Site is also known as the Chatsworth Calera Site, it is located southeast at Woolsey Canyon Road and Valley Circle Blvd. This is the site where bricks and tiles were made for the San Fernando Mission. There is a plaque for the Lime Kilns State Marker number 141. The Munch Box is Los Angeles Cultural Historic Monument number 750 and literally a "taste of the past". This is an historic hamburger stand built around 1956. Still in operation, it offers outdoor seating, and is known for its hamburgers, fries, chilidogs and root beer. Located at 21532 Devonshire Street, the building has a unique "space-age" facade of straight-lines, yellow stucco, and red trim. 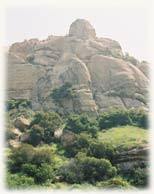 Stoney Point has been a landmark since prehistoric times, guiding Native Americans through the later named Santa Susana Pass. Many Indian relics have been found nearby. The site is a popular location for movie and television companies. It is Los Angeles Cultural Historical Monument No. 132 and is a 76-acre park owned by the Los Angeles City Department of Recreation and Parks. It is best known for its scenic beauty. Mountaineering enthusiasts travel far and wide to experience climbing and rappelling strategies amongst towering and spectacular rock formations. There are also small caves for exploration, trails for hiking, and vistas for photo ops.